Oil tank FAQs – Oil Storage tanks frequently asked questions. These are some of the most frequently asked questions about oil storage tanks. Oil tank FAQs, help and advice on Oil Tanks. 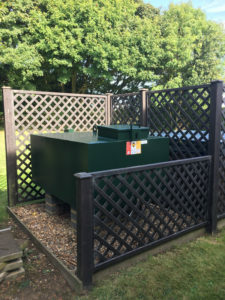 A bunded oil tank is a tank within a tank or double skin oil tank, oil is contained in the inner tank and the outer tank acts as a protection.Designed for several reasons, including; protection from the weather and elements. Also if an oil spillage were to occur, the fuel would be contained in the bund area. Building regulation advise that all tanks to be bunded. A Single Skin Oil Tank is a single container in which fuel is stored. There is no bund or catchment area and, in the event of a spillage an environmental issue can occur. How can I get rid of the smell of oil after a leak? Biological washing powder sprinkled down over oil leak area can help with the smell of oil after a spillage. What rules and regulations should be followed when installing an oil tank? You should refer to OFTEC (www.oftec.org.uk) for guidelines and regulations regarding fuel. How close to my house can I have my oil tank? An oil tank has to be a minimum of 1.8 metres away from any part of a building or construction that isn’t fire resistant (doors/eves/cladding/). Oil storage tanks are available in Plastic or Metal.